Roam Artisan Burgers was located directly next door to The Brick Yard on Russian Hill in San Francisco, CA. The Brick Yard was Brick in years past, and Brick served up a remarkably simple and delicious cheeseburger. It was my hope that the cheeseburger gods had conferred the torch of awesomeness one door down. This from the Roam website. 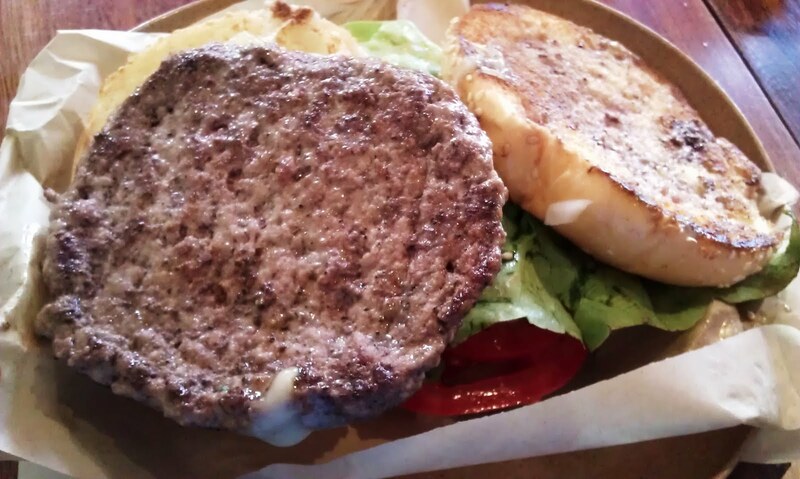 "From pasture to plate, Roam Artisan Burgers offers delicious burgers, sides, shakes and sodas crafted from fresh quality ingredients that have been carefully sourced from a select group of purveyors." Fat Bruce Lee and I ordered a couple of the 4-ounce The Classic burgers ($5.99) with cheese ($1 extra). The Russet Fries were $2.99. We ordered a single serving of these, as well. All told, a cheeseburger and fries at Roam Artisan Burgers was $10. We ordered at the register and waited about 15 minutes for our order to arrive. Sadly, my burger was slathered in the house sauce on the first attempt. I had asked that this be served on the side. I returned my burger to the counter, and waited an additional 15 minutes for a refire. This was ridiculous, since a refire should take precedence rather than start at the back of the line. By the time my burger arrived, my party had all but completed their meals leaving me to rush as they watched. The Beef: I was not able to discuss the beef with the staff, since it was lunch time, and I did not want to slow down the line. I took them at their word that the beef was sourced locally and that the beef was 100% grass-fed. That led me to believe that this was our old friend, Niman Ranch Chuck. The smallish patty delivered a hefty dose of beef flavor, and it was very juicy. I pegged the fat content at the standard 20%. There was no funk, so it was safe to assume that the beef was fresh or, at the most, wet aged. The bite was firm but not chewy. 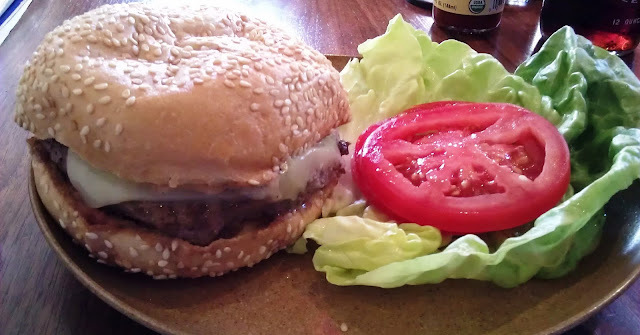 The beef was solid in the burger at Roam Artisan Burgers. The Seasoning: Oof. My burger was heavily salted. It was salted to the point of the seasoning being a distraction. The salt was on the verge of being overwhelming. Honestly, I had already waited 30 minutes for a 4 ounce burger, and I didn't want to wait any longer. There was a little pepper in the mix, but that was masked by the salt. The Sear: The sear was only faintly present. The burger patty had the appearance of having been steamed rather than cooked on a properly hot flat top. I assumed that the kitchen covered the burgers to make them cook faster. This rubbery wetness was present on all 4 burgers at the table. This was a tragic error, because by keeping the surface temperature low, it robbed the burger of the flavor and textural benefits of the Malliard reaction. Frying the burger rather than steaming it would have created the proper and crusty sear that the tasty beef and I both deserved. 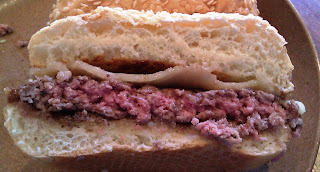 The Preparation: The burger patty was cooked on a gas-fired flat top to a pink and juicy Medium. The patties were tender and juicy. It seemed fair to assume that Roam Artisan Burgers took daily delivery of freshly ground Chuck from their supplier. The patties were formed from beef ground at a medium setting, and I would have guessed that the burgers were formed during morning prep. The beef tasted suspiciously like what I have tried on the previous evening at Super Duper Burgers. Super Duper used freshly ground, Niman Ranch Chuck. Super Duper just cooked it faster and better for a lower price...and they served up a bigger burger. Like Super Duper Burger, Roam also used the Strauss Organic Soft Serve, which was splendid. The Cheese: The Aged White Cheddar was salty, rich, and full of umami. It was also unmelted. This was frustrating when I considered the 30-minute wait for that over-salted, steamed burger with unmelted cheese. The Bun: The bun was a yeasty, chewy, dense, heavily seeded, burger bun with an absolutely fantastic texture. Unfortunately, it was only weakly toasted, so it did not benefit from proper preparation. The flavor was great, but the texture was lacking. 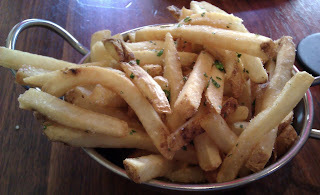 The Fries: We sampled the Russet Fries, and they were properly cooked, full of flavor, and nicely seasoned with salt and parsley. They were par cooked, so the crispness was there. The fries tasted like they had been cooked in fresh canola oil. The Toppings: The Bibb lettuce and tomato slices were both fresh, juicy, and delicious. The BBQ sauce, which I had on the side was tangy, and it tasted strongly of molasses. I liked that with the fries. The Value: At Roam Artisan Burgers, the price for a smallish burger, fries and soda was in the $14 range. That meant that the value was weak for such a small portion of slow-to-the-table and sloppily prepared food. The ingredients and pricing at Roam Artisan Burgers set the stage for a world-class burgers. The preparation and execution at Roam Artisan Burgers was comparable to what one might expect from a fast food burger chain. The flavors were great. In fairness, after the meal, the cashier did come to the table and provide a gift card to comp my burger since my meal arrived as my companions were finishing theirs. In the end, I missed Brick more than ever. I also appreciated Super Duper all the more. 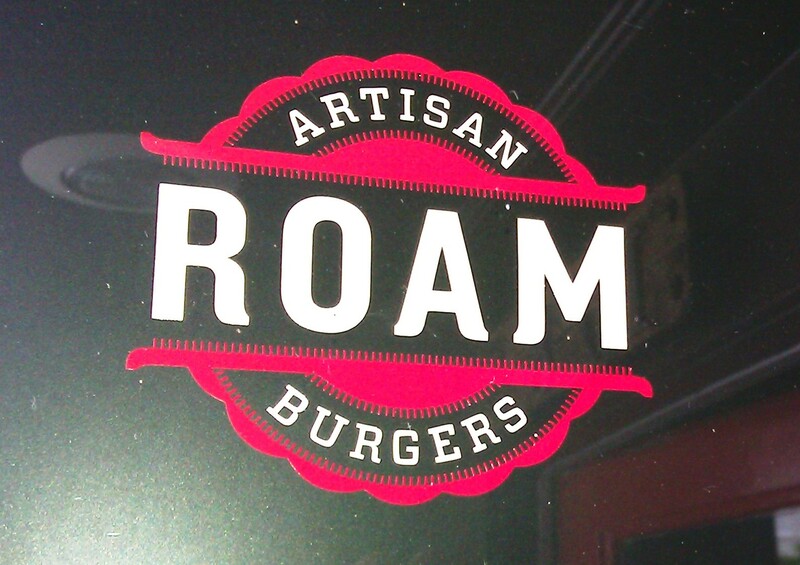 Burger Review : Great ingredients, but I would suggest trying Roam Artisan Burgers during non-peak hours. The burger, while delicious, was haphazardly prepared. It seemed like the kitchen staff was dealing with being chased by hornets while preparing my meal. I'm very confused why this place got such a high review when everything I just read made it sound like a place to avoid. The flavors and ingredients were really great. The prep and service factors, I wrote off to a rough patch. The fact that they comped the meal once they realized that things went wrong made up the missteps and left me to judge them on ingredients and value. The food was great--the value was weak. That evened out to a 4.